When someone first asked me if they could add dog poop to their compost pile, my immediate response was a firm NO! No Way! NADA! But just to make sure, I decided to consult an expert. And who better to consult than the self-professed Queen of Dog S*%t, Susan McCullough, author of HouseTraining for Dummies and blogger at the Metro DC Dog Blog. Susan and I are on similar missions. We both blog about what we love (gardening for me, dogs for Susan) but we also try to encourage people to take care of the planet while they are diggin’ and doggin’. We both know that things like chemicals and dog poop should NOT go into the groundwater. Anyway, Susan did recommend that people not put pet poop in their compost piles. But since Susan always has the latest scoop on poop, she also went on to tell me about how Cambridge, Massachusetts uses dog poop to power lights in their park and how Ithaca, NY was collecting dog poop for possible future composting. She also showed me this hilarious video that I just wanted to pass along to my readers, since I know there are a lot of you out there who love dogs as much as I do. I’m hoping this dance will catch on and be the new rage in 2012! The Fairfax County Environmental Quality Advisory Council has scheduled a public hearing to solicit comments on the state of the environment in Fairfax County. The public hearing will be held on Tuesday, January 17, 2012 at 7:30 p.m. in the Board Auditorium of the Fairfax County Government Center. The public is encouraged to attend EQAC's public hearing to share views on the state of the environment and to identify environmental issues applicable to Fairfax County. Environmental issues considered by EQAC include water quality, air quality, noise, hazardous materials, solid waste, stream valley protection, wildlife management, light pollution, visual pollution, climate change response and adaptation, energy conservation, land use, transportation and the use and preservation of ecological resources. EQAC welcomes written and/or verbal testimony. How/Where do you give back? Do you have a favorite charity? As the year draws to a close, now is the perfect time to remember the organizations that help to bring happiness to your life, and to the lives of others. We still have a few days left to make our charitable donations for the 2011 tax year. I once read a short book entitled The Five Lessons a Millionaire Taught Me About Life and Wealth, by Richard Paul Evans. I especially like lesson five: Give Back. Evans says, "Hoarding wealth will make your life small and cold. Giving will expand it." He goes on to say, "And service, through sharing our wealth and our time, is love made visible." Evans believes in financial karma: that "we get back when we give", and I agree. I believe that life, like gardening, is all about sowing what you hope to reap. I admit that I don’t always feel like I have extra money to donate. But between the two, I usually find that I have more money than time to contribute. There are so many worthwhile charitable organizations that are doing so much for all of us. So I make an effort to make at least one donation during each tax year and I encourage you to do the same. You probably already have a favorite charity. There are many groups that help to preserve nature, create public gardens, educate potential green gardeners, etc. But if you are looking for a new group to make a donation to, the IRS has an online resource that can help. On the IRS site, you can put in a keyword and a state, and the site will display a list of organizations eligible to receive tax-deductible charitable donations. You can search for keywords such as nature, wildlife, garden, Chesapeake, DC, trees or anything else that comes to mind. There are also other sites, such as Guidestar.com and charitynavigator.org but these lists don’t seem to be as comprehensive. Albert Einstein: It is every man's obligation to put back into the world at least the equivalent of what he takes out of it. Anne Frank: No one has ever become poor by giving. John D. Rockefeller Jr.: Think of giving not as a duty but as a privilege. Peyton Conway March: There is a wonderful mythical law of nature that the three things we crave most in life -- happiness, freedom, and peace of mind -- are always attained by giving them to someone else. Thornton Wilder: Money is like manure; it's not worth a thing unless it's spread around encouraging young things to grow. If you are looking for the best way to dispose of your Christmas tree, first consider some of these ideas for using your tree in your garden. If none of those ideas appeal to you, there are different rules for tree disposal depending on where you live. Also, keep in mind that many of these trees are ground into mulch, which is later available to you for little or no charge. This effort has many beneficial results and also conserves space in the landfill. In Fairfax County, if your tree is less than 8 feet, you can put it out by the curb during the first two weeks of January for no additional cost. If your tree is larger than 8 feet, contact your trash hauler for collection details. Mulch created by Fairfax County is available to residents free of charge at these locations. The Montgomery County solid waste website says: We will collect Christmas trees on your recycling day from Monday, December 26, 2011 through Friday, February 3, 2012. Please put your Christmas tree at the curb by 7 a.m. on your collection day. After February 3, 2012, you may still recycle your tree through their curbside yard trim collection. Please note that the tree must then be cut into smaller pieces. Mulch created by Montgomery County is available to residents free of charge at these locations. For District residents, the DC.gov website says: Holiday trees and wreaths will be picked up curbside from January 3 to January 14. Remove all decorations and place the greenery in the treebox space in front of your home between Monday, January 2, and Monday, January 9. Please do not put the trees in plastic or cloth bags. Trees collected between January 3 and 14 will be recycled. Any trees not collected by January 14 should be set out with your trash to be picked up as space in the trash trucks allows over the following weeks. Residents also can bring trees to the Ft. Totten Transfer Station weekdays, 1 pm-5 pm, and Saturdays, 8 am-3 pm, for free tree chipping. Information about getting free mulch from Arlington Virginia is available here. In Frederick County, Md., residents can drop off their trees at the following drop off points starting Dec. 26 and ending on Jan. 25, 2012. Information about mulch from Frederick County is available here. My husband just LOVES Christmas but he always worries too much about what gift to get me. Since my life is already so good, I can rarely think of a darn thing to tell him that I want or need. Truth be told, as corny and romantic as it sounds, sharing my life with a wonderful, joyful man like Tom kind of makes every day feel like Christmas. I’ve mentioned before that he is the one who taught me much of what I know about being an eco-friendly gardener. And he really still is the primary gardener in our household. He not only carefully tends our gardens in a complete organic and eco-friendly way, but he always makes sure that my bird and hummingbird feeders are full and that the birdbaths are ready for visitors. In other words, much of the happiness that I get from living in our own little woodland habitat of critters, birds and butterflies; eating meals made from fresh, home grown organic produce; and knowing we are doing our part to help take care of the planet, is because of my live-in Santa Claus, my husband Tom. So, sweetie, if you want to know what to get me for Christmas, just keep gardening with me. I love what we are growing together. And readers, I’ll apologize in advance for this REALLY corny poem. And I promise it will be my last one for this holiday season! so we can light the fireplace tonight. And we can cuddle by the firelight…. Let’s face it. Gardening is all about choosing what we do and don’t want to grow on the chunk of land that surrounds our home. It is up to us to decide what is welcome and what is not. We define what is a weed and what isn’t….what forms of wildlife are a nuisance and what forms are welcome. We usually even decide what areas the plants and animals must remain in, setting up garden borders and designated feeding stations for wildlife. Other people may not agree with or even understand our gardening style. A front yard full of vegetables may fill your heart with joy and your refrigerator with fresh food, but may earn only raised eyebrows from your neighbors. The same is certainly true of a yard that welcomes birds, bunnies, squirrels and deer. You may look at these visitors with awe and wonder and your neighbors may be having visions of venison and rabbit stew. And a yard left to “go wild” with native wildflowers and shrubs may be called weedy and unkempt by those with a penchant for a more manicured look. “Green”, eco friendly gardeners may face additional challenges when it comes to being accepted by the rest of the neighborhood, as they integrate rain barrels and compost piles into their landscape design. But eco-friendly gardening has many benefits. The use of native plants, the elimination of chemicals, the capture and re-use of rainwater and garden waste all do their part to help protect not just one garden, but every interconnected piece of property and, eventually, the entire planet. So how do you keep peace with your neighbors while you are creating a more eco-friendly landscape? Just remember that it is all about R-E-S-P-E-C-T! R – Recognize the right of other people’s opinions. Remember that although you have a right to your coneflowers and native grasses, your neighbor has the right to a manicured lawn, plastic geraniums, and cement lawn deer if they want. E - Educate. 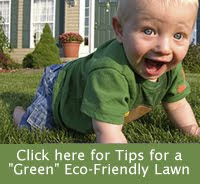 You have good reasons to create an eco-friendly landscape -- let others know them before you start. If you tell your neighbors why you're tearing up the lawn, or planting native plants, or constructing a rain garden, chances are that they will be more likely to accept it. Share the Metro DC Lawn and Garden Blog with them so they can learn more. S – Set it apart. Something as simple as keeping a neutral zone between your eco-friendly landscape and the property of others can go a long way in keeping the peace. A simple border of lawn, hedge or fence provides a nice transition area between landscapes. P – Personalize it. Add interest to your yard with paths, benches, sculptures and other human elements, letting your neighbors know that your yard is as much your own personal sanctuary as it is a place for environmental stewardship. Decorate or disguise rain barrels and compost piles to make them less obtrusive. E – Ease into it. You will reduce expense, increase the effect of your learning curve, enjoy your efforts more, and engender less resistance from neighbors if you start in small steps. C – Certify it. Once your eco-friendly landscape is established, it may easily qualify as a National Wildlife Federation certified habitat. Applying for certification and displaying the Certified Habitat sign will let everyone know that your yard is a special place, deserving of recognition and admiration, not contempt. T – Trim, tend and primp. Although eco-friendly landscapes often require less care, that doesn’t mean they should be neglected. Keeping your plants pruned and your flowerbeds weeded and mulched will help to give “green” gardens the neighborhood seal of approval. Remember, your eco-friendly landscape is a great gift to the planet. Taking a few extra steps to make sure that your landscape fits in will help your efforts earn the recognition and respect that it deserves. For more information, visit the Wild Ones Handbook on the EPA website. I've often written about the fun and important function of Citizen Science Programs. What I call Citizen Science programs are any programs that encourage people to go out and monitor various forms of wildlife and report their statistics so that scientists can study the habits and habitats of local wildlife. There are wildlife monitoring programs for birds, butterflies, hummingbirds, frogs and other forms of wildlife. These programs are open to anyone with an interest in wildlife. In most cases, the only skill required is the ability to count! They are a great opportunity to get outside with your family and explore the creatures that live around us. The best known of these counts are the various bird counts conducted, in part, by the National Audubon Society. Starting on Wednesday, December 14th, you can participate in one of the more popular of these counts: The Christmas Bird Count. If you would like to get more information about a bird count in your area, use this search tool to find the count nearest you. Yikes! How can there be less than two weeks until Christmas? If you are still looking for gift ideas for the eco-friendly gardener on your list, here are a few last minute suggestions. *Please note: catalog links provided are for reference only and are not recommendations on my part. Many of the products were chosen for their unique or “green” qualities. Whenever possible, I suggest you shop local. Pamper your gardener. Forget the day in the spa. To pamper your favorite gardener, give them gifts to protect their hands and skin. Every gardener needs garden gloves but eco-friendly gardeners are often more hands-on than other gardeners. Why? Because we don’t stand back and spray weeds or bugs with toxic chemicals. We get right down there in the dirt and hand pull weeds and hand pick bugs. Gloves are good. Along the same lines as gloves, eco-friendly gardeners can use kneelers for getting down close to their gardens and hand tools used for weed removal. And hats are great to help protect faces from harmful UV rays. All of these products can be found locally at garden centers or even big box stores. Give the gift of water AND cleaner local waterways. You can buy or make a rain barrel to give. But make sure the gift is used and appreciated by helping the recipient install it. Other options for saving water are water timers ($19.95 from Plow & Hearth) which provide automatic shutoff after a designated amount of watering. And there are even high-tech models that check the weather on the internet $499.00 from CyberRain) and then set your irrigation systems for you, depending on the weather forecast. Nurture their soul - Butterfly or hummingbird garden kits can be purchased ready made, or you can make your own by checking our lists of plants for hummingbirds and butterflies and picking up seed packs at your favorite garden supply center. Don’t forget to include a book (or pages printed from the internet) about how to create a butterfly or hummingbird garden. The gift that keeps on giving: Compost Buckets – IMHO, everyone should compost. But having a big pile of decomposing plant matter in the corner of one’s yard isn’t for everyone. But compost buckets come in all shapes, sizes and designs. From stylish kitchen designs that sit on a kitchen counter and allow for collection of coffee grounds and eggshells, to high tech under counter kitchen models that do all the dirty work for you($199 and up from NatureMill). You can even go a step further and buy worm composters or even products that compost pet poo. But again, these gifts are only appropriate for the dedicated green gardener. Subscription to local gardening magazine – One of the main principles of eco-friendly gardening is to learn to garden WITH Mother Nature, not against her. That means plant things and use techniques that are known to work in the area that you live. When things like rain, snow (or dark of night) keep the avid gardener inside, there is nothing quite like curling up with a great garden magazine that makes you eager to get back out there in the dirt. Since 2005, Washington Gardener Magazine has been providing information to gardeners in the DC/Virginia/Maryland region. A yearly subscription is $20.00 and contains six issues. Should you give plants? I don’t really recommend giving plants to people unless you are sure about the site conditions of their property and how much time and energy they plan to devote to gardening. I think a gift certificate or gift card at a local nursery is much more thoughtful and allows them to choose their own plants or opt for something more soothing to their garden soul, such as a wind chime or bird bath. Of course, one of the best things that you can give to any new gardener is your time, your expertise and your enthusiasm. Being generous with all of them may be the greatest gift of all. And of course, the greatest gift for a garden blogger?????? Our followers! Thanks so much to all of you and remember, you can join us on Facebook, too!